For those of you who don’t know, the Whit Friday Marches (to give them their proper name) is a series of contests held in villages in the Oldham/Saddleworth area on a certain day each year for Brass Bands. At each village they compete at each band plays two marches. The first march is used on the march up to the stand and is not marked as such (though some villages do have prizes pertaining to this march, more on this later…), and the second march is played on a ‘stand’ to judges hidden away in caravans, buildings etc, so that the contest is marked blind. For the more serious brass bands out there Whit Friday is an opportunity to show off skills and earn money by doing well at the various contests, even winning overall. However for bands of a lesser ability the day still holds much appeal as an excuse to drink and be merry, as well as playing a bit of brass! So rewind back to Friday May 29th… This year LUBB decided to take things a bit more light-heartedly – so many top quality bands enter Whit Friday contests we don’t really enter with hopes of winning, but just for the fun of it anyway. So in an effort to get the most fun out of the day we decided to dress up as zombies and march to Michael Jackson’s Thriller. Because of this the day started a little earlier than Whit Friday normally would, with everyone congregating in County Bar (where else!) beforehand to get kitted out as zombies! By the time the bus was approaching our first village of Lees several of the band were a bit desperate for the toilet, calling in at a local pub before we even got registered to play. At Lees was one of our longest waits to play and although it didn’t rain, it was a little chilly waiting in our zombie costumes in the wind… Still it was an opportunity for some photo taking, and eventually the time came when we had our turn to play. Overall in Lees we came 27th (although we didnt find this out until a couple of days later). The next village on the list was Grotton, where we had a surprisingly short wait before we played, turning this village into a bit of a shorter stop than we were probably anticipating! Overall we came 30th in Grotton, and quickly sped on to the next village to try and catch up on some of the time we’d lost whilst queuing in Lees. Next stop was Lydgate which proved to be a bit more popular – although we didnt have much of a wait before the march up to the stand we did have a little pause before going onto the stand, which afforded time for group photos and bathroom breaks! Overall we came 62nd in Lydgate, which was actually our lowest placing of the day. The next village on the list was Friezland, a contest reserved for 3rd & 4th section bands, as well as youth bands. Here LUBB experienced a short wait, but when we did finally march we were told to carry on through the gates (the march usually stops before), as it was expected our costumes and piece would generate a fair bit of interest! In fact in Friezland the band ended up winning the prize for Most Entertaining, as well as coming 22nd overall, our highest placing of the day! Next stop for the band was Greenfield, where hunger won out, and a lot of the band stopped for food during the wait to play- resulting in a rather hasty return to the playing queue when we realised that we were on next and half the band were in the chippy… Greenfield was the longest march of the day, meaning that instead of the once through (if that) that we’d played of Thriller at the other villages, we made it through 4 times! Nobody had told me just how long the march was at Greenfield, and I’d chosen this village to swap my trusty cornet for Abi’s Euphonium…Needless to say I was a bit knackered by the end of the march! Greenfield looked to be a hugely popular spectator village, with many lining the main street as well as watching at the stand! In between the two pieces there was enough time for some more group photos, taken by Annabel, our lovely supporter and photographer for the day. Overall in Greenfield we came 43rd. Our last village of the day was Delph, a popular end to Whit Friday for many bands, meaning that there was a bit of a wait before our final performance of the day. The atmosphere in Delph was fantastic and the village was super busy, with the streets lined the whole way down the main street, and many of the pubs full to bursting. It had turned dark by the time we played in Delph and a lot more instrument swapping went on (although this time I stayed with my trusty cornet!). Overall in Delph we came 57th (a higher placement than Black Dyke, who were disqualified for breaching rules to do with the band needing to be present and ready when called to play). After we performed in Delph we had a bit of time to chill out and watch the some of the other bands perform before heading back to Lancaster around midnight. Our final performance of the day in Delph. Of course there were many other things which happened on the day, such as Simon covering Alex in fake blood on the bus, then pronouncing ‘well, it doesnt look THAT bad’, me nearly having a head-on collision with a tuba when the driver braked very sharply and I was sat in the death seat topping up people’s make up (which gave me a rather impressive bruise on my leg), as well as us being unable to find our (rather minature) bus after Delph and many other incidents amongst those, making the day a truly memorable experience. 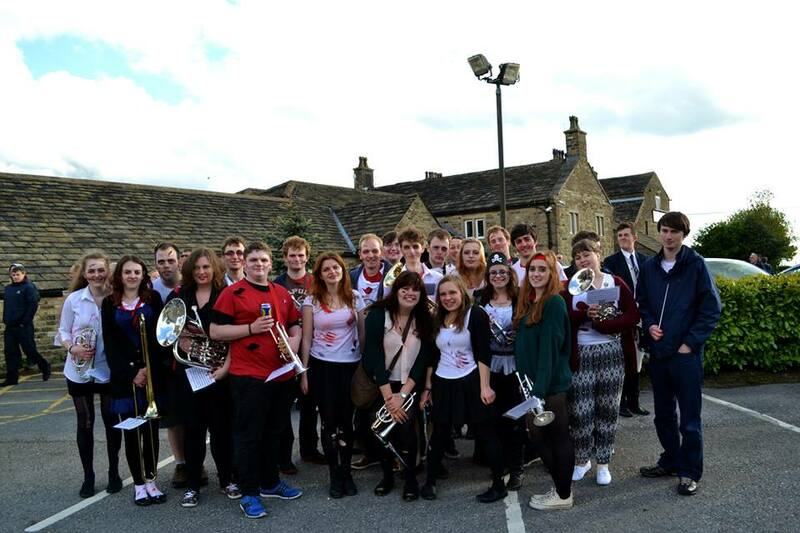 If you’ve never experienced Whit Friday it might seem like a bit of a strange phenomenon, but its one that’s a lot of fun to partake in, whether as a spectator or a performer, and I can’t wait to do it all again next year, something I’m sure the rest of the band agree with me on! theamazingsimon on A New Logo for ULMS! Ali Gray on Proms Lead Up – ULMS Symphony Orchestra! Sheila Richards BMus(Hons) F(MusEd)TCL LTCL LLCM on Proms Lead Up – ULMS Symphony Orchestra! theamazingsimon on Proms Lead Up – ULMS Symphony Orchestra!